The El Paso Valley has a history of irrigation dating back to the 1800's. Orchards, vineyards, and cultivated fields were watered from the Rio Grande through a system of acequias, or irrigation ditches. After the mid-1800's, colonization and development of the irrigated valley began increasing at a rapid pace, which placed a heavy demand upon the irrigation systems that had been in use. A number of private irrigation companies were established in the El Paso Valley, and laid the foundation upon which the present day distribution system was built. The Reclamation Act was passed by the United States Congress on June 17, 1902 to encourage water project development and irrigation in the western states. In 1905, the El Paso Valley Water Users Association was formed to encourage the construction of Elephant Butte Dam 140 miles upstream from El Paso. The Act of February 25, 1905, extended the Reclamation Act to a portion of the State of Texas bordering the Rio Grande. This Act, known as the Rio Grande Reclamation Project, provided for the construction of the Elephant Butte Dam and Reservoir on the Rio Grande in Truth or Consequences, New Mexico, for the impounding of flood waters for irrigation purposes in southern New Mexico and far west Texas. The Treaty of 1906 with the Republic of Mexico obligated the United States to deliver water to Mexico after the completion of Elephant Butte Dam. Construction of the Elephant Butte Dam and Reservoir was completed in 1916, and by 1925 the major system of canals and drains, as they exist today, had been constructed. Construction of the Caballo Dam and Reservoir was completed in 1938. This system became known as the Rio Grande Project, and includes the El Paso County Water Improvement District No. 1 in Texas, and the Elephant Butte Irrigation District in New Mexico. All waters in the reservoirs are appropriated for the downstream users of Elephant Butte Irrigation District, El Paso County Water Improvement District No. 1, and the Republic of Mexico. In Texas, the Rio Grande Project provides water for 69,010 acres of water right lands, all of which are located within the boundaries of the El Paso County Water Improvement District No. 1. The District contains 156 square miles, with over 350 miles of canals and laterals in the distribution system, and over 269 miles in the drainage system. Irrigation water is delivered through canals and laterals to more than 2,205 turnouts, irrigating crops of cotton, alfalfa, pecans, chiles, wheat, milo, vegetables, pastures, and family gardens. The Rio Grande Project was operated and maintained by the United States Bureau of Reclamation until 1980, when the El Paso County Water Improvement District No. 1 took over the operation and maintenance responsibilities. On January 22, 1996, the El Paso County Water Improvement District No. 1 accepted ownership of the canals, laterals, drains, and other waterways within its boundaries from the Bureau of Reclamation. We have made water conservation a priority, and have made many efforts towards accomplishing our goal of delivering surface water in the most efficient manner possible. Today, the District is responsible for delivering water to over 32,727 accounts. Although many property owners have chosen to subdivide their lands in response to the growth of the City of El Paso, the irrigation of farm land continues to account for the majority of the water used in the District. With an average rainfall of eight (8) inches per year, irrigation in the El Paso Valley is dependent upon water received from the Rio Grande. Nowhere is the need for water conservation more apparent than in the semi arid desert region of the Southwest. The El Paso Valley has had a long history of irrigation and crop production, but it would not have been possible without water from the Rio Grande. 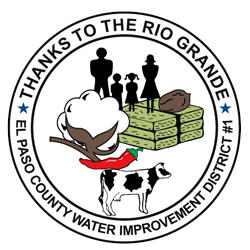 As shown on our District logo, we appreciate the Rio Grande.